Megabus UK contact telephone number, email and correspondence address are: +44 141 352 4444 (8am - 8pm); enquiries@megabus.com and Megabus UK, Buchanan Bus Station Killermont St Glasgow G2 3NW. Reach Megabus UK now for any problem, enquiry or complaints. Megabus is committed to providing the best train, bus and coach services to its millions of passengers in the UK and beyond. But sometimes, things do go wrong. If you have any Megabus problem or complaint, please do feel free to contact them now. Be rest assured that they would do their very best to put things right and make you happy. Megabus UK operates from a number of offices across the United Kingdom, but are mainly based in Edinburgh, Scotland. See how you can contact them below. Telephone. 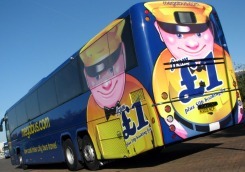 Megabus Telephone number for Customer services issues is - +44 141 352 4444. Phone lines are open from 08:00 till 20:00 Mondays to Friday. Please note that if you chose to contact Megabus UK by phone, Calls cost 10p per minute from a BT landline, calls from mobiles and some other networks may be higher. Local or international call charges may apply depending on location. Email. You can send Megabus an email on enquiries@megabus.com. This is the best way to contact Megabus for complaints. Any such complaint would be recorded, prioritized, and responded to within 72 hours. Please put in as much information as possible in your mail as well as evidence, where applicable. If the reason for your call or seeking the contact information of Megabus UK is for an answer to a specific question, why not go through the Megabus FAQ section first and see if your query might already have been answered. Where does megabus.com operate to and from? Can I take a bicycle with me on this service? Do children pay on megabus.com? How do I use my Tesco Clubcard tokens for megabus.com journeys? Can I take my dog on board the bus? If you have looking for answer to any of the above or more, please go to the Megabus Frequent Asked Questions section here.